This is pretty much the only “pure” comedy Jim Carrey has made that I really like. Before Liar Liar came out I was not a fan. To me he was just some dude that made stupid comedies that I was forced to watch, because my dad liked them, like Dumb and Dumber or Ace Ventura. But Liar Liar incorporates a little bit of seriousness, giving the audience a glimpse of Carrey’s very impressive acting chops. Carrey plays a lawyer who puts work before family, which inconveniences his ex-wife and affects his relationship with his young son. The poor kid just wants to spend time with his dad, but Dad is constantly missing important milestones in his son’s life and lying about why. Even more insulting, he’s not even good at lying (I mean, he’s a lawyer. Isn’t that kind of their thing?). This penchant for telling tall tales leads his son to make a very special birthday wish: that his dad can’t tell a lie for an entire day. Liar Liar is kind of the perfect film for someone like Jim Carrey. There is a lot of insanity and opportunity to play scenes over the top, which was pretty much his bread and butter at this time. However, this movie incorporates a small amount of drama that was missing from his earlier comedies. Thanks to this injection of seriousness, the audience finally got to see that Carrey could act. Like, really honestly act. Liar Liar was the perfect comedy to ease Carrey’s audience into the idea that he’d soon be taking on meatier roles in The Truman Show and Man on the Moon (both excellent). I’ve always loved Carrey’s more dramatic fare better than his straight up silly comedies (controversial opinion, I know), but this is a near perfect fusing of these two styles. The only part of this movie I don’t really like is that Carrey’s character and his ex-wife reconcile at the end. Given that Mrs. Doubtfire was released four years earlier and provided a more realistic resolution to its divorce story, it’s embarrassing that Liar Liar goes with the “Mom and Dad are getting back together!” angle. Then again, this is a movie where a kid’s birthday wish actually comes true. It’s clearly a fantasy, by any stretch of the imagination. 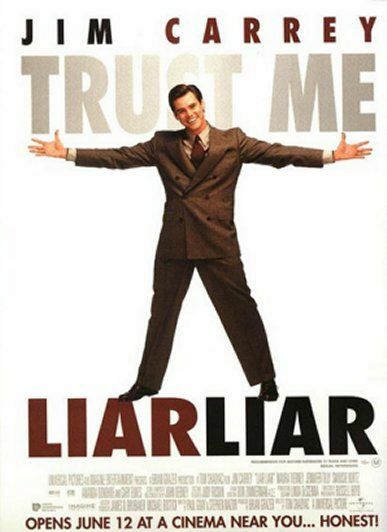 Liar Liar was released during Jim Carrey’s heyday. He was coming off the somewhat disappointing The Cable Guy, but everything he had made before that had been a huge hit. After The Cable Guy bombed, Carrey really needed a hit to prove the first few years of his career were not a fluke, and he found the perfect vehicle for his rubber faced antics in Liar Liar. Carrey plays hotshot lawyer Fletcher Reede. Fletcher spends most of his time at the office, meaning he neglects his son Max (Justin Cooper) regularly. When Fletcher misses Max’s birthday party, Max wishes his dad could not tell a lie for a whole day. To Fletcher’s horror, the wish comes true and he now has to tell the truth for 24 hours. This complicates his upcoming trial where he plans to lie his pants off in order to get a cheating wife (Jennifer Tilly) a 50% share of her husband’s assets. Winning this case is important as it will likely mean he will be asked to become a partner in the law firm he works for, but can he still win the case when he is not able to tell a single lie? Throughout the film, Fletcher realises what a terrible father he has been and that he needs to spend more time with his son. Liar Liar is the perfect film for Carrey. Watching him try and lie and not be able to do so doesn’t sound that entertaining, but when someone as energetic as Carrey is giving the performance, you can’t look away. I thought The Cable Guy was a bit unfairly criticized when it was released. It was not a bad film, just such a huge departure from what we were used to seeing Carrey do. Liar Liar brings Carrey back to the slapstick fun we expect from one of his film. Despite the fact that Fletcher begins the film as a terrible father, you never really hate him. Carrey is likable enough that you still want him to do well despite the fact that his inability to lie is severely hampering him. Liar Liar is one of Carrey’s better comedies. Worth seeing for Carrey’s rubber faced antics alone.